The great Russian writer Anton Chekhov (1860-1904) desperately needed money all his life. But maybe his constant need for work was what produced many of his greatest masterpieces. Chekhov had an exclusive deal with the publisher Adolf Marx, who owned the rights to all the writer’s works – present and future. The value of the contact was 75,000 roubles –a small fortune at the time, but Marx paid the sum in small installments, in return for new manuscripts. Nevertheless, Chekhov bought a small house in Yalta with money from this contract. However, Chekhov found a way around the terms of the agreement – the contract didn’t cover plays. The Cherry Orchard was published by Marx, but royalties for the stage version went to the writer. It is no coincidence that more than half of Chekhov’s stage plays were written after he signed the contract with Marx – including Three Sisters, and no fewer than 10 short plays. Although Chekhov spent his entire life looking for money, he was never short of ideas. He could produce a captivating story out of everyday situations. His works did not push a specific ideology, which was contrary to fashion of the time. “You cannot be a writer unless you have convictions!” said one of the students. “I'm afraid I do not have convictions,” Chekhov replied. “Correct. It’s just entertainment,” Chekhov agreed. Chekhov never regarded himself as a great writer. He described his own occupation as a writer of “current literature” - something that is read today, but will be completely forgotten tomorrow. “You know how long they will keep reading my books?” Chekhov once asked fellow writer Ivan Bunin. 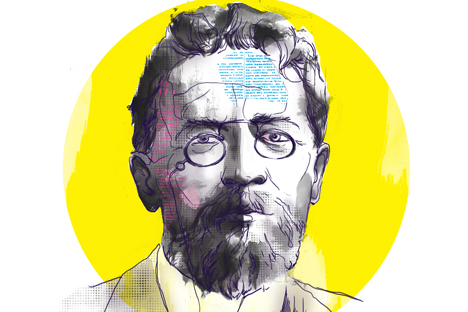 Chekhov never played the genius. He merely aimed to produce a solid, well-made and well-polished product. The rest was the “silvery yonder” he so despised. And the natural result of delivering a well-made product is money and creature comforts. Some new Chekhovian texts continue to materialize to this day, 100 years after Chekhov's death. That’s something Chekhov himself could have written in one of his stories. That’s exactly his kind of humour.